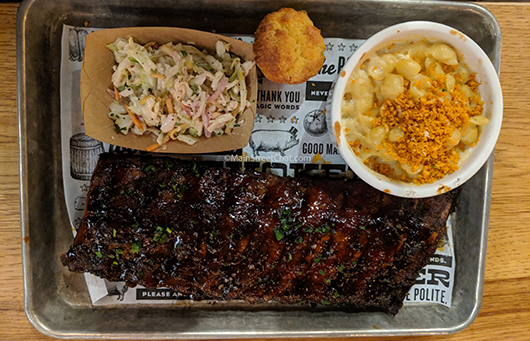 The Polite Pig is a BBQ restaurant located inside Disney Springs at Walt Disney World. The menu includes a limited starter list, salads, sandwiches, smoked meats, sides, and a modest desert selection. The bourbon menu is more extensive than the food offerings with 68 different bourbons available. They also serve beer, wine, and specialty small batch cocktails. Dining at The Polite Pig is like dining at a traditional quick service location with a few small modifications. It’s a very odd mix of service and self-serve which we really did not enjoy at all. For example, after placing your order, you find your own seat, get your own highchair, drinks, and any BBQ sauces that you want. Then the food is brought out to you by a server who will take any extra food orders and will help you with anything else you might need, including to go boxes. The reason we have an issue with the way The Polite Pig conducts business is because its very disjointed. The staff can’t really seem to make up their minds about what type of restaurant it is. For example, when I placed my order with the counter they HIGHLY (and I mean highly) encouraged me to give a tip. I would have given a tip anyway since someone was going to bring the food to our table but I would have probably stuck closer to 10% and not the 18% that I gave. The main issue was that our server didn’t do any of the traditional duties for a server, though he was tipped appropriately. He dropped off the food and then disappeared, we did not see him again for the remainder of our meal. We needed to place another order and we couldn’t find him, same story when we needed to go boxes. In fact we had to flag down another server, who was working in another section to place an order for our daughter and to get to go boxes. On top of being encouraged to give a large tip at the time of purchase, you are expected to give another tip for any other items you may have purchased while at your table. Why not just make this a standard sit down restaurant with a more traditional approach to serving food? It would have saved a lot of time and headache for us. I probably would have been much happier with our whole experience if this had been the case. Even if it had been 100% self-serve we would have been a lot happier. Please note that the second server that helped us was great. She really did try to make up for being forgotten about. Our main issue was she was the one who should have received the tip in full. She did the work and earned that money. At The Polite Pig we went for the “all from the smoker” traditional bbq plates. Which included a jalapeno corn bread muffin, coleslaw, and one side option. For our meats we opted for the pork shoulder and ribs, the back bone of BBQ establishments. For sides we got the macaroni and cheese and Brussel sprouts. The ribs were on the bony side. The meat had a good smoked flavor and the rub was delicious. The rub contains a lot of black pepper so it does have a slight kick to it. Unfortunately, for us, that’s as far as it goes. We honestly can’t give the actual BBQ a good review. Typically when Adolfo and I go for BBQ we tend to pick places that go with the low and slow method where the meat becomes fall of the bone tender. (Joe’s Real BBQ if any of you are from the valley). Polite pig is a far cry from that. The ribs were very chewy and it was hard to get the meat off the bone. 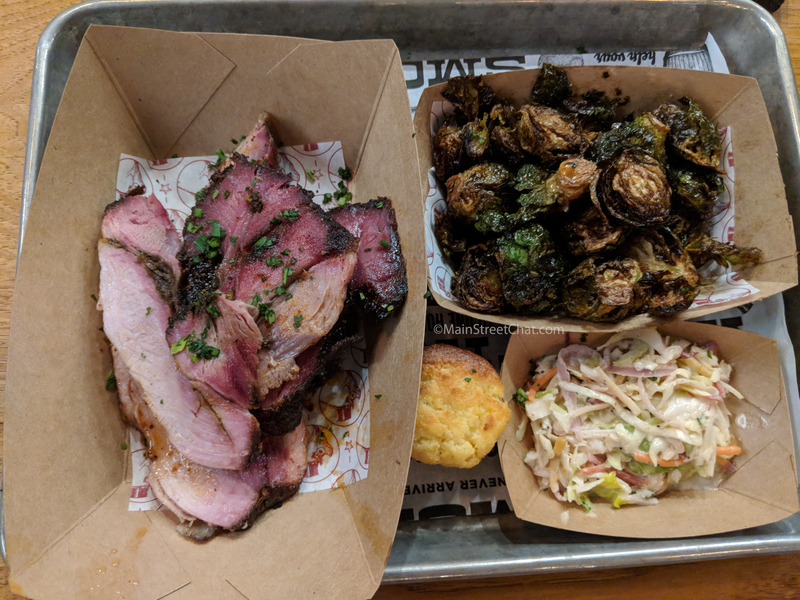 The pork shoulder honestly seemed like it wasn’t cooked long enough as it still had solid chunks of fat in it. The jalapeno corn bread was pretty negligible because it’s a super small portion. Now don’t get me wrong the cornbread was tasty but it’s half the size of a mini muffin, we really didn’t see the point of even serving it. The coleslaw has a mayo vinegar dressing. It wasn’t really a huge hit with either of us. It pretty much tasted like it could have come out of a bag from the grocery store and it was drowned in the dressing. Now before you accuse of us dumping on The Polite Pig we have to say that they shine with their sides! They were absolutely delicious. The Brussel sprouts were perfectly roasted and have this amazing bourbon sauce. The mac and cheese was to die for! I kid you not, I will be going back for that macaroni and cheese. In fact, it’s probably the only reason I would step foot inside The Polite Pig again. Pro tip: skip the BBQ at The Polite Pig and get the trio sides’ platter. It’s great for an afternoon snack and then you can get dinner somewhere else. Would we eat at The Polite Pig again? Nope, not unless some major changes take place. Including the way they serve the food and the menu. It was expensive for portion size (considering the Ribs were mostly bone) and the food just wasn’t very good. Like I said I would totally come back for the Mac and Cheese, but I’ll get it to go.